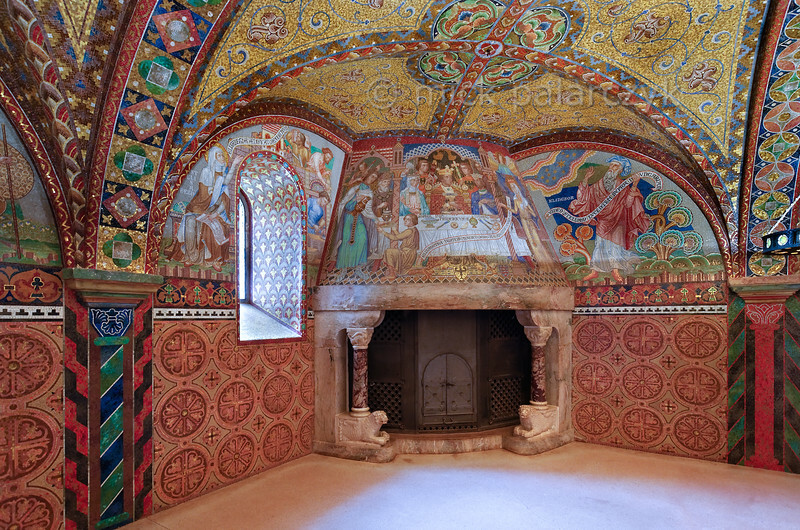 [GERMANY.THUERINGEN 30312] The Elisabeth-Kemenate in the Wartburg is decorated with mosaics (1902-1906) showing scenes from the life of Saint Elisabeth (1207-1231). She was a princess of the Kingdom of Hungary and was brought to the court of the rulers of Thuringia, to become betrothed to Louis IV, Landgrave of Thuringia. After his death she left the Wartburg and dedicated her life to charity and caring for the sick. The Wartburg is a medieval castle situated on a hill south of the city of Eisenach. The castle's foundation was laid about 1067 by the Thuringian Count of Schauenburg, Ludwig der Springer. Photo Mick Palarczyk.